Biking is an exciting sport and leisure activity, but can also be a dangerous one. Although watching it from the comfort of your home with your best friends or pet feels safe, it’s not the same out there. You need a pair of good bike knee guards when you go biking, especially if you’re a professional biker. It doesn’t take a genius to understand why your shin can hurt so much if accidentally hit when you fall off your bike or get hit by your bike pedals. Your knees & shins is vulnerable when you go biking as the nerve endings and bones on this part of the body are close to the skin. This means a minor bump or hit can see you scream in pain. Therefore, you need to protect your knees from fatal injuries while biking. Manufacturers develop knee guards to help bikers protect this delicate and vulnerable part of the body from injuries. Just like soccer players with their shin guards, soldiers with shields and boxers with mouth guards, bikers need knee and shin guards for protection while taking rides on various terrains. Made from comfortable and lightweight materials, bike knee guards absorb shock and force for bone and skin protection. You can enjoy biking without fear of getting hurt for an exceptional riding experience around your chosen destination. Whether you’re new to biking, seek to protect your kid or want to give out knee guards as a gift, there’s one out there for you. We’ve selected five of the best bike knee guard brands on the market, showcasing one from each, to help you find the best pair for you. You’ll need a pair of good biking shoes and a helmet to complement your knee guards. 7iDP has over six decades worth of combined experience in product management and MTB design protection. This explains why the brand is increasingly gaining market command despite being a new kid on the block in the mountain biking world. The company is renowned to design high-end products that deliver on their functionalities. The Covert shin guard is lightweight and offers different levels of protection for customizable use. A plastic kneecap and two interlocking foam pads lie within the sleeve to offer customized protection. You can easily pull the shin guard apart to reveal the foam/plastic padding. With it you can easily remove or combine various pads within the mesh sleeve made from poly/spandex materials to suit your rides. The two-layer custom foam is used to make the shin pads with a focus on reducing weight while improving air flow. When running on the most rugged trails, take advantage of the three layers for maximum protection. A single pad would do for easy trails. You can also mix and match the pads to get a desired outcome for any particular trail you intend to ride on. For instance, you can opt for a less bulky combination for lightweight use. A combination of spandex and Poly materials is used with a mesh fabric that stretches all-round to allow proper ventilation and offer a perfect fit. The shin also has a 1mm cap to facilitate pedal movements and offer a superior fit due to high strength, low weight and flexibility. Designed to surpass the CE EN 1621/1 standard, the knee pad can completely protect your shins from injuries. Available in four sizes, the shin guards can fit more sizes for you to choose from. Easily remove the knee cap and foam inserts if you want to clean your pair of shin guards. Given an X-shape, the pad promotes fluid pedaling action to secure it in place while riding your bike. Despite being fully-sleeved, the pads are breathable with a close fit and also dry fast. The shin has premium finish with solid stitching throughout its body for added strength and durability. The spandex panel shapes hold the pad in place while still allowing easy movement when pedaling. Although the pads offer complete comfort, flexibility and protection, they lack on side knee protection. And despite being compression type knee pads, they’re built for durability. However, they’re not full-onmountain bike shin guards. As a trail rider or enduro racer, the pads are designed to offer sufficient protection for your aggressive rides. Built in a compact design, you can easily pack these shin guards for use on the go. Troy Lee Designs is renowned for its iconic two-wheeled sports riding gear. The company also has a good reputation for manufacturing products of premium quality. The Raid Shin Guards are breathable, lightweight and durable. The knee pads have been designed with an enduro or downhill rider in mind, offering flexible mobility and sufficient protection. The D3O CE certified shin pad comes in a strong construction and well-thought-out design. 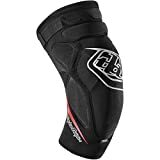 As an improvement of the company’s earlier knee pads, 5450/5400, these shin guards have sectioned padding on each side of the knee pad and at the top for extra cushioning. It does this without hampering your mobility. Featuring a silicone-like strip dubbed PU ‘Fit-Lock’ calf band, the shin guards restrict the neoprene and mesh fabrics from stretching. In addition to a standard strap at the top, the knee pad features a silicone band on the inside at the top and has a grippy touch. On the back panel lies a thin mesh to enhance ventilation. Available in SM/XS, MD/LG and 2XL/XL sizes, your pair of shin guards should fit snugly. What’s more, you don’t need to adjust these pads while riding. The minimalist pads offer comfort for long rides or all-day pedaling, shuttles with buds and DH laps as they’re lightweight and breathable. 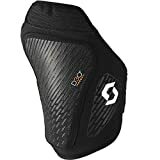 Built with abrasion-resistant cover, the knee pads offer protection from rock smashes, slide-outs and full ejects because the plastic pads stay in place with every hit. It does a better job at offering protection from piercing contact such as the pointed edge of a rock. This is attributed to the fact that the D3O material works by spreading out the sharp impact to protect your skin from injuries. Despite countless rides on this pad and many machine washes, it retains its shape in the long-term. It has layers of stitches for added strength and durability. The Raid Shin Guards are also comfortable and reliable. Every biker, whether you ride on all-mountain or enduro trails, yearns for highly functional, protective and comfortable knee pads to use in varied situations. The POC Joint VPD Air Shin Guards are both functional and aesthetic. Made from Visco-Elastic polymer Dough (VPD 2.0) material, the knee pads are breathable for free air flow and lightweight for easy mobility. The material is comfortable, highly absorbs impact and adapts to offer a perfect snug fit. Designed for flexibility and safety, the material is soft when worn in normal conditions and hardens to offer protection from impacts. Constructed with subdued look and clean lines, the shin guards are made from premium and lightweight materials for durability and easy mobility. The fabric gives the pad its structure and form, stretches to support flexible mobility and is sturdy to withstand wear and tear. pad in place while riding. It has an elastic band to anchor the pad on the top side to the rider’s thighs. With the VPD compound padding, you won’t just experience malleability in warm weather, but enjoy comfort and flexible mobility while pedaling despite the shape of your legs and knees. The reinforced stretch fabric offers extra strength for increased durability. With the polygiene odor control technology, you don’t have to worry about your pads stinking from absorbing sweat. Available in small, medium and large sizes, there’s a pair of these shin guards for almost every rider out there. They cover the top, bottom and sides of the shins for complete protection. However, the pads get brittle in winter or cold weather and can easily break. Furthermore, the double layering on the back of the pad could be reduced and ventilation enhanced to minimize bunching during rides. 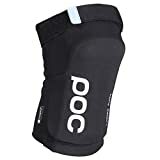 If you’re looking for low-profile, non-slip knee pads to trail ride, dirt jump or use downhill, you won’t go wrong with a pair of these mountain bike shin guards by POC Joint. The Dakine Hellion Shin Guards are constructed with the malleable 3D-molded DK Impact foam to absorb the impact of shock. With CE-certified impact areas, the knee pads have been properly constructed to withstand regular use. Made from durable materials and designed to offer complete coverage and protection, the shin guards are ideal for downhill gravity rides. Although they’re properly ventilated, the shin pads aren’t ideal for long trail rides. What’s more, they become less flexible in cold weather, making them unsuitable for rides in winter or in cold regions. The pads are also bulkier, non-slip and offer strap security for short bike rides. The rubber grips used to line these pads for non-slip use might make removing them after use quite difficult and painful, especially if you’re hairy. Scott is a popular sports brand among bikers. The company manufactures attractive, reliable and high quality sports equipment, gear and apparel. Ranging from hoodies, shirts and shoes to headbands, caps, backpacks and wristbands, the company has all your sporting needs catered for. Whether you’re a professional biker, novice or just looking to begin your biking experience, there’s a pair of good Scott bike shin guards out there for you. The Scott Soldier 2 Knee/Shin Guards are comfortable and lightweight to protect your shins when going for long trail rides. Made from a careful selection of mesh fabrics and a newer version of the D3O Protector, these shin guards have been enhanced to offer more protection. Although they’re strapless, the pads are highly comfortable and functional to protect your shins from injuries. Unlike the Grenade EVO downhill pads and Grenade Pro II, these knee pads are more breathable and lightweight. The orange D3O pad, made from an elastic visco material, lies within the mesh sleeves and is malleable and soft. However, if you hit or crash your shin, molecules within the soft pad react by developing a stiff mass to dissipate and absorb the shock energy. The D3O comes in a unique design, featuring hexagon shapes to enhance thickness and flexibility for better shin protection. Whereas the solid pad offers protection from big impacts, the hexagon shapes absorb impact energy from medium-sized hits. In addition to the smooth, abrasion-resistant mesh fabric, the material used on the D3O has small holes for proper ventilation. 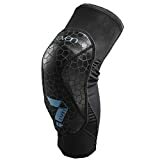 Unlike earlier Soldier shin guards, this improved version has the pad wrapped around the kneecap on both sides of the knee to offer additional protection. Due to the location of the small inner EVA foam and the right/left-specific shape of the shin guards, the pad offers protection from impacts of the top tubes. Built with elastic bottom and top, there are three silicone strips on the pads to secure them in place. The pad stretches in all directions for easy movement. The bike shin guards also have flat and neat seams. 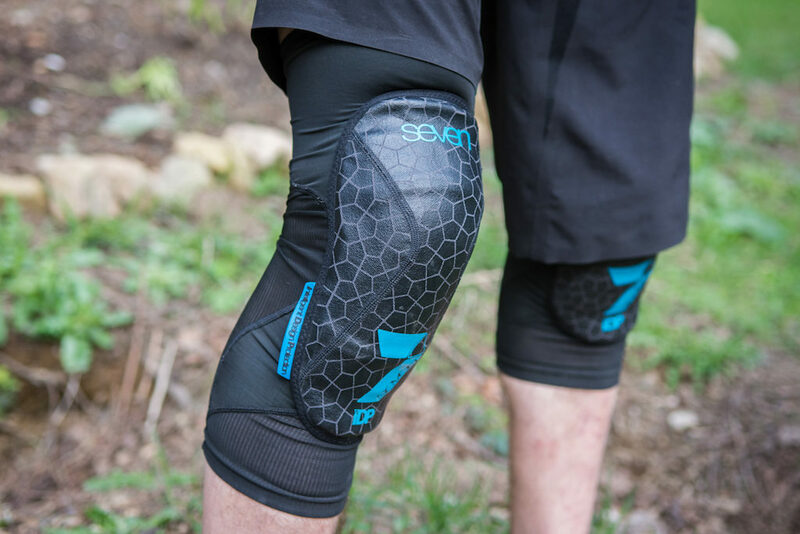 Designed to leave a gap between your knee and the pad, the Scott Soldier 2 Shin Guards are breathable, elastic, don’t retain water and barely stinks. Although they’re built for long term durability and use, the shin guards lose elasticity over time. However, since the D3O is heavily curved, it keeps them in place. Most of the above knee pads have 2-3 inches of protection for the upper shin area, but if you are looking for FULL shin protection then review some of the the products in the table below. Though full protection is uncomfortable on long rides, they are good for shorter tough MTB trails. If you have ever fractured your shin, you will know the pain which can takes months to properly heal. Whether you’re a novice biker, a seasoned trail or mountain rider, or just looking to explore biking, you need to protect your shins just like other vital body parts. Depending on your needs and whether you go for long or short rides, you’ll find an ideal pair of shin guards among our featured top five. It’s also important to consider the price of any given pair of knee pads. Buy shin pads you can afford yet built for durability, especially if you’re a long-haul mountain bike rider.